New AeroPress, but What’s It Made Out Of ? The good folks at Aerobie have a few reasons why they changed the plastic they use in the AeroPress. Probably the greatest reasons Aerobie saw fit to changing the plastic used in their AeroPress design was that there were worries that the high humidity and temperature resistant polycarbonate, used to make the chamber and plunger of the AeroPress, might be prone to leaching BPA. 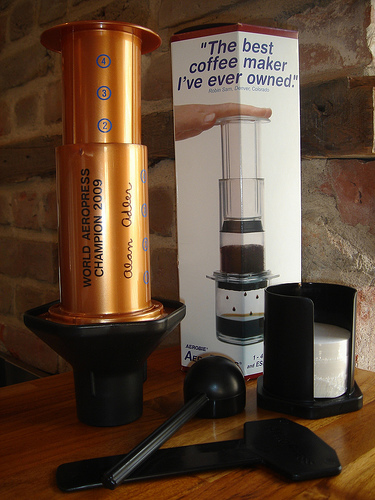 At the World Coffee Project™, we have to admit that some members on our team were also concerned with this very issue, but overlooked this concern for reason that the AeroPress produced such a superior cup of coffee. As for the older, cloudy blue AeroPress models, these did contain phthalates, though they were never shown to contain any signs of the dreaded BPA. When the people at Aerobie had the Aeropress tested by an independent lab, they found that, even in a well used AeroPress, there was absolutely no amount of BPA traceable. So, if you’re asking yourself, does my old AeroPress contain BPA, the answer is no. With all that said about BPA, the people at Aerobie still decided on a copolyester plastic for their newest model, and there were two reasons for this. First, even though there were no traces of BPA in the original AeroPress, the people at Aerobie thought that the new material would take away perceived risks associated with BPA, and second, the new material would allow the company to make a clear model. Unlike it’s old-school, cloud blue counterpart, the people at Aerobie thought that the new material would give the coffee maker a more appealing look and allowed one to get a better look at their brew. Local Opera, Kansas City Symphony, Chamber Orchestra, KCUR Public Radio, KCPT Public Television, National Kidney Foundation, American Red Cross, American Cancer Society, Leukemia Foundation and March of Dimes, just to name a few. Just yesterday The Roasterie took part in a blood drive with a Give Blood Get Coffee campaign where it gave out a free bag of coffee to everyone who volunteered to give blood. The Roasterie is also committed to serving the global community and this can be seen by the companies creation of the St. Drogo Foundation, named after the patriot saint of coffee. The foundation helps the local communities that produce The Roasterie’s coffees. 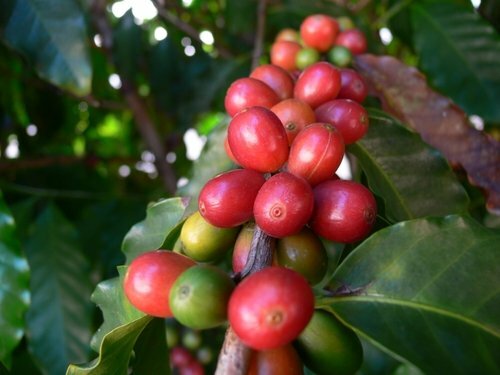 In many cases The Roasterie pays up to 4 times the price offered by the commercial industry, and gives back a portion of every bag sold, to the communities it buys form. By partnering with other organizations The Roasterie has been successful in providing children with education and health facilities for its coffee growing communities. If you see The Roasterie’s products or are around the KC area, we would suggest that you should check them out, and if you do, we would love to hear your thoughts. Recently during a visit to the Mid-Atlantic some of our team had the pleasure of visiting the Chesapeake Bay Roasting Company in Crofton, Maryland, and we have to let you all know that we love what these guys are doing. Whether it’s hanging around the roastery drinking espressos, sponsoring conservation efforts, or hosting the local Green Drinks group, you’re bound to find the team at the Chesapeake Roasting Company engaged in the two things they love most, coffee and community. The Chesapeake Bay Coffee Roasting Company is an eco-friendly coffee roastery that is committed to giving-back to their local community, and they do this in several ways. One is by the creation of their H2O Initiative which is the company’s community outreach program, geared at advocating their give-back message and supporting organizations and community groups making a difference in the health and well being of the Chesapeake Bay. In fact, a portion of every dollar the company makes goes to preserving some aspect of the Chesapeake Bay watershed, one of the areas leading natural resources and treasures. Another way the company gives back is buy it’s commitment to being green. While touring their facilities we had the privilege of learning about the companies newest addition to the team, a state of the art roaster. The Chesapeake Bay Roasting Company boasts one of the world’s most efficient and eco-friendly coffee roasters, consuming nearly 20 percent less energy and reducing emissions by almost 80 percent when compared to traditional drum roasters. The company is also taking a green approach to its packaging using sustainable canisters which can be recycled or reused after use. Great guys, with a great vision and love for coffee and their community, we can’t get enough of this stuff. Thanks for the inspiration.